Per his military service record (regimental no. 4903), Thomas Thorne was born at Hay, N.S.W. He gave his age as 22 years and 2 months, his marital status as married, and his occupation as motor driver. His description on his medical was height 5 feet 6 inches tall, weight 140 lbs., with a dark complexion, brown eyes, and brown hair. His religious denomination was Church of England. He claimed to have 6 months experience with the Lawson Rifle Club. He joined the Coo-ee March at Lawson, and was attested at Lawson on the 7th November 1915. After completing the march he went to Liverpool Camp as reinforcement for the 13th Battalion. He completed his medical at Liverpool on the 13th November 1915. On Private Thorne’s embarkation roll his address at time of enrolment was Christabell Street, Lawson, N.S.W., and his next of kin is listed as wife, Mrs. M. A. Thorne, C/o Mrs Page, Casino, Carr-Street, Coogee, N.S.W. Along with many of the Coo-ees, Private Thorne departed Sydney on the HMAT Star of England on the 8th March 1916, and arrived in Egypt on the 11th April 1916. Following being admitted ill on the 11th April 1916 to the 31st General Hospital in Port Said, Egypt, he marched in to 4th Training Battalion, Egypt on 21st May 1916. The name and embarkation date of the transport ship that took Thomas Thorne to England from Egypt is not recorded in his service record. The next entry in his service record notes Acting Sergeant Thorne admitted to Devonport Military Hospital on 16th June 1916, and then his death two days later of Pneumonia on 18th June 1916. 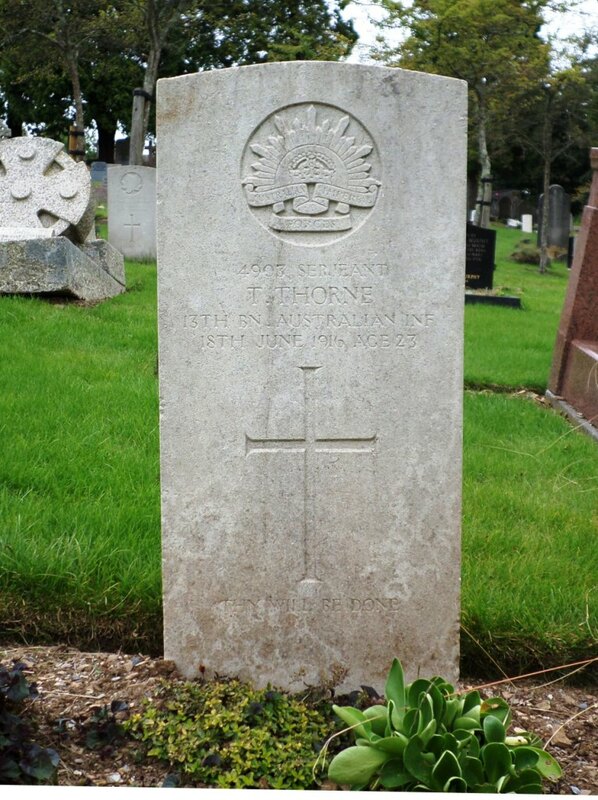 Sergeant Thorne was buried at Plymouth (Efford) Cemetery in Plymouth, Devon, England, on the 21st June 1916 with full military honours. Thomas Thorne’s name is also listed on the Lawson War Memorial.